It is with great sadness that the family of Katherine Cullari (better known as “Grams” to all who loved her) announces her passing on Sunday, March 24, 2019 at the age of 99. Grams passed on peacefully in the comfort of her room at Willow Bay Senior Resort in Deerfield Beach Florida where she has resided for the past 14 months. Grams was born and raised in Newark New Jersey where she dedicated her life to family and church. Her love and gift for cooking delicious Italian food made her home the place for many wonderful family celebrations. Whatever you needed and whenever you needed it, Grams was there to lend a hand! Or maybe I should say “take over” :). She lived her life to the fullest with great strength and courage to the end. She always knew how to comfort others and put a smile on their face. We are so grateful to have had such a wonderful role model in our lives. She is preceded in death by her husband of 58 years, Dominick “Tom” Cullari, sons, Frank and Donny, parents, Joseph and Rose Fulco, brothers Pete, Louis and Sal and sister Mickey. 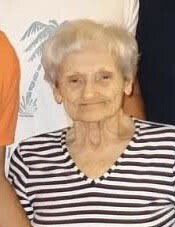 Grams will be lovingly remembered by her daughter, Rose, and Son in law, Jerry who took great care of her for the past 10 years. She will also be fondly remembered by her 7 grandchildren, 17 great-grandchildren and 2 great-great grandchildren! Her memory will live on in our hearts forever. The family would be grateful for your love and prayers for peace and comfort.